1. Open Chrome and navigate to "Settings." Before you can actually set Gmail as your default email client, you need to allow Gmail to ask you permission. To do so, open a window of your Chrome browser and click the three-dots icon next to the URL address bar. Then click "Settings". 2. Click on ADVANCED at the bottom of the screen then find and click on "Content settings" Under "Privacy and security." In the Settings tab that appears in your Chrome browser, scroll down to the bottom and click "Advanced." This will expand your settings options. In the first group that appears, "Privacy and security," click "Content settings" second from the bottom. 3. Select "Handlers" then turn on the Ask protocol. 4. Open Gmail in Chrome and click the Protocol Handler icon. 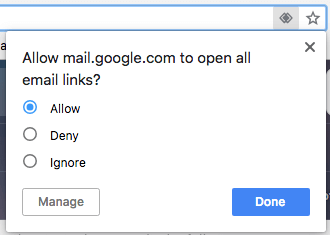 Once your Ask protocol has been switched on for default handlers, open Gmail in a new tab and make sure you're signed in. 5. Allow Gmail to open all email links. Click "Allow" in response to the question Chrome asks you, as shown above, and then hit Done. You'll officially have all "mailto:" links open in Gmail if they come from your Chrome browser.